Sometimes your grandmother’s place can be full of surprises. During high school and middle school I would go to my grandmother’s house at least once a week (if not every day) and wait for my mother to get back from work, though later during that period of time I went less often. Mostly I went just to see my grandmother and help her with things around the house, and then would take the bus home. 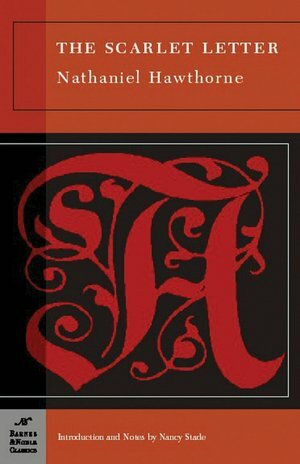 I would not have imagined that during all of those years I went over there, that sitting atop a bookshelf in the living room, covered in dust, was a second edition copy of Nathaniel Hawthorne’s The Scarlet Letter (first published in 1850). I found this while cleaning out my grandmother’s house after she moved to Virginia a few years ago, and took it as my own rather than have it be sold at one of many garage sales. Most high school kids have to read this book as a part of their English class curriculum. I never read it, but I did check it out Wikipedia, so I think I have a pretty good grasp of what it’s all about. It’s the story of a woman in Puritanical America in the 1600s, who commits “adultery” by having relations with a man and becoming pregnant while her husband is thought to be “lost at sea” (i.e. dead). The book seems to contain a lot of obtuse 19th century social and religious morality, making it something that I have no intention of reading myself. The concept, however, of having any object (especially a book) that is more than one hundred and fifty years old is amazing in and of itself. Having objects that are that old makes one think about the history of the object itself, along with the time in which it was made. There is also a feeling of exclusivity and value in having first (and even second) editions of any well-known or cherished book. This ties into an article I wrote earlier about the disappearance of bookstores and, in some ways, of books as a physical media. With the rise of e-books one can argue that the exclusivity of first editions is increasing. However, if e-books completely take over actual books (which is doubtful since downloadable music still hasn’t even beaten records out of production), this exclusivity and eventual sense of antiquity will be lost forever. Since this is unlikely, even with the number of people I see with some kind of kindle, etc. seemingly growing exponentially by the day, antique books like this still have the propensity to perpetually increase in number. In spite of all of the wonderment and value with which such books are endowed, I still don’t want to read The Scarlet Letter.